And hold them within our clasp. Searching with a broken heart. "Hey, did anyone find mine?" And they sparkle and they shine. Only a parent in grief would know. For the treasure we have found. At our children that have died. And release them from inside. The one they have earned so well. As a tear runs down our face. As we turn and walk away. As our eggs begin to sing. We see them flutter and move about. "Look, our eggs all now have wings." "Your children are safe with me." "You'll be with them when the time is right,"
Knowing our children didn't die. As it skims across my face. As it brightens up this place. Before the sky begins to drip. That trickle down across my lips. Of every flower that's in bloom. From the corners of my room. It's winter here in my room. There's a chill down to my bones. And I feel so all alone. Of death, and grief, and tears. And Easter egg hunts on Sunday? Where is all the laughter? And springtime with its flowers? And dressing up in brand new clothes? And just talking away the hours. Where is his Easter morning smile? And his way of bringing happiness? And his hug that held me so tight? with fragrance and with joy. When life was so kind. And death in this place. � Luke was in a youth group when he was 16 years old. One night the leaders sent them all on a mission as part of a group activity. Those who had cars and wanted to drive, did so, and were assigned about 5 boys to each car. Luke drove and was given instructions as to where to meet the rest of the cars at the end of the activity. He also was given a bag containing more instructions, some items, and places to stop on the way to the destination. So Luke and the 5 other boys got into Luke's car as instructed. Luke was not supposed to open the bag until they were inside the car. As they sat there in the parking lot, Luke opened up the bag. There inside Luke's bag were blindfolds and carrots!!! The instructions were that all the passengers (the other 5 boys) were to put the blindfolds on and hold a carrot in their right hand until they were to their destination where the activity would be concluded. Under no circumstances were any of the passengers to remove their blindfolds or let go of their carrots until they reached their destination, which only the driver of the car (Luke) knew. So the other boys put on their blindfolds, held on to their carrots as Luke drove out of the parking lot on the way to their assigned mission. � All was going well. They were laughing and having the best time, stopping at the assigned places, staying blindfolded while holding on to carrots. Then there was a problem. At an intersection some woman� ran the stop sign and hit Luke's car. It was only a minor fender bender, but the police came to the scene for the report. What took place next is the best part of the story. � When Luke got home that night, he said "Mom, I was in an accident, but no one was hurt". "You won't believe what happened". He then proceeded to tell me the above story. When he was telling me the part where the police came, he was laughing uncontrollably. By this time I was laughing too, not even knowing what he was going to say. Luke said "Oh, Mom, it was the funniest thing you ever saw." "The police officer came to our car and I had 5 guys in the car with blindfolds on and holding carrots". Luke said "I tried to explain it to the policeman that it was a game and what was going on, but I was laughing so hard that the officer thought that we had all been drinking." Luke continued to tell me how he was given a sobriety test and that he passed perfectly, except for the uncontrollable laughter. All the other boys in the car were laughing too, but could not see what was going on.� Through all of this they all kept their blindfolds on, held their carrots, made it to the destination, and had the best story of all the other cars to tell. � If I could� choose to relive one day with Luke without any changes, I might just choose that day when he came home full of excitement telling me his story. But there are many other days that I could also choose. Oh how I would long to get all dressed up and go to church with Luke as a little boy on Easter Sunday. How wonderful it would be to decorate eggs, have an egg hunt, run through fields of flowers, look for four-leaf clovers, walk together through the forest, have a picnic, watch the sunset together, tell him over and over that I love him, or just sit and talk for hours and hours. There are so many good days to choose from. Many years have passed since that night of blindfolds, carrots, fun, laughter, and a simple thing of listening to my son tell me a wonderful story. To this day, I smile through my tears and laugh just a little, every time...... 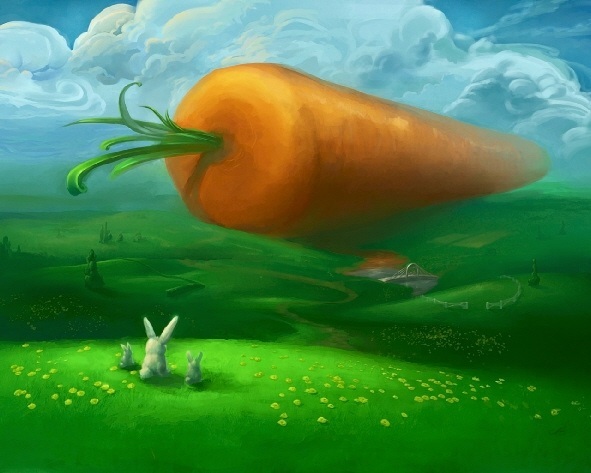 I see a carrot. And knew that we were blessed. And hid them quietly in the back. And yelled when they were found. Talked for hours 'neath the tree. I remember so many wonderful things from Luke's childhood.... how we held hands, his cute little giggle, the way he gently touched me, his hugs and kisses, and especially I remember Luke's relationship with Lamby-Pie. When Luke was a little fellow his best friend in the whole world was his big sister Emily. They did everything together, but when she started school he was so lost. One day his grandma gave him a little white stuffed lamb. The little lamb had a yellow sewn-on T-shirt. Well, Luke absolutely loved that little lamb. He named his little lamb.... Lamby-Pie. This little lamb became Luke's very best friend and went everywhere with us.... restaurants, car rides, vacations, picnics, shopping, playgrounds, wagon rides, walks.... just everywhere. Oh how Lamb-Pie loved to slide and swing and see-saw! 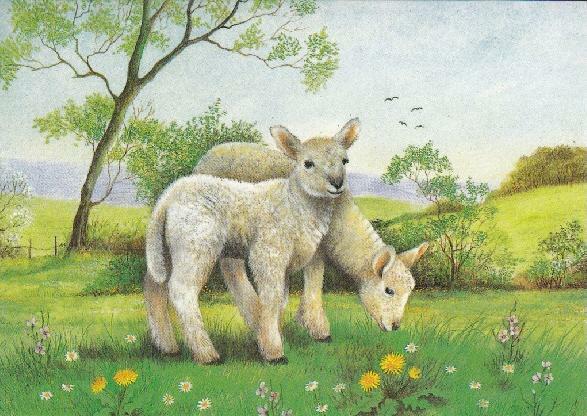 A lot of children had imaginary friends, but not Luke, his friend was very real.... his friend was Lamby-Pie. Lamby-Pie loved macaroni and cheese, and snow cones, and milk.... and Lamby-Pie had the stains to prove it. After awhile poor little Lamby-Pie wasn't very white anymore. I was amazed at the things that Lamby-Pie could say, but Lamby-Pie spoke only to Luke. Luke would tell me that Lamby-Pie said.... "Let's go for a walk around the block Mommy," or "Let's eat some ice cream Mommy," or "Let's play in the sandbox Mommy," or "Let's read a book Mommy". That Lamby-Pie sure was a talker and always got Mommy to do things even when Mommy was very busy around the house. But I loved it, and I was so glad that Luke had such a wonderful friend to help him not feel so lost without his sister. Sometimes just after Luke and I would take Emily to school, we would go to the McDonalds just down the street to play on their playground. Luke and Lamby-Pie had so much fun together. I knew Luke was lonely without his big sister so Luke and I and Lamby-Pie went to McDonalds often. One day Luke met another little boy on the McDonalds playground and began playing with him. Oh what a wonderful time he had with his new found playmate. He was so excited telling me all about it on our way home. When we arrived home and started to get out of the car Luke reached for Lamby-Pie, but Lamby-Pie wasn't there. My little boy looked at me with big tears in his eyes and said..."Mommy, I left Lamby-Pie at McDonalds." I knew this was a very serious thing. So we immediately drove back to McDonalds. We ran out to the playground to get Lamby-Pie, but Lamby-Pie was nowhere to be found. Luke and I were both looking frantically for his little Lamby-Pie. Luke called out..." Lamby-Pie, Lamby-Pie, Lamby-Pie," but Lamby-Pie was silent. He walked up to me as I squatted down to hug him and his broken heart. He said..."Mommy, Lamby-Pie is gone." By then we were both crying. 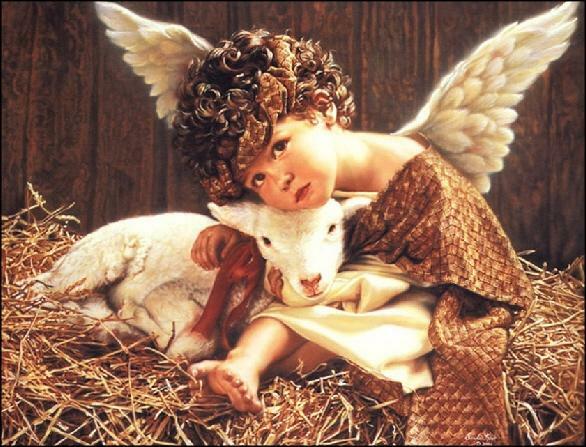 I thought to myself, why would anyone want that dirty old, stained-up, little lamb. So on our way out of McDonalds, with one last effort, I walked up to the counter and sighed as I very sadly said... "Did you happen to find a little stuffed lamb?" The guy said with a huge grin...."Yes, I did and I put it behind the counter! I just KNEW someone would be back for it because it was so worn and obviously so loved." He went and got Lamby-Pie and handed him to me and I squatted down again as I handed him to my wide-eyed little boy. Luke immediately held Lamby-Pie close to his chest as those last big tears ran across the lips of a huge smile. For the next several years Luke and Lamby-Pie were inseparable. As Luke grew older, his interests grew older, and Lamby-Pie spent a lot of time alone. I knew Lamby-Pie was a very special little lamb so I put Lamby-Pie in the cedar chest for safe keeping, hoping to someday give him to Luke's little boy. Luke never had the opportunity to have his own little boy so when Luke died, I brought Lamby-Pie out of hiding and placed him in a glass enclosed doll case and displayed him in the foyer with all of Luke's special things. A few weeks ago, not long after Luke's 11th anniversary of passing, I had a dream of Lamby-Pie. In my dream Lamby-Pie told me that he had something to tell me. But I woke up without ever hearing Lamby-Pie's message. As soon as I got up that morning I went to the foyer, reached for the glass case, opened it, and took Lamby-Pie out. I felt such comfort standing there holding Lamby-Pie with his tiny scratched eyes, and his matted stained fur, and his little dirty yellow T-shirt. As tears streamed down my face, I held Lamby-Pie close to my chest, just as Luke did so many years ago when Lamby-Pie had been lost. I said.."Lamby-Pie what do you need to tell me?" But Lamby-Pie was silent, I guess he still only talked to Luke. So I just touched his stained fur and inhaled his stale scent. But as I was touching his fur, I felt something very lightly touching my finger. I looked and there barely peeking out from under the edge of that little yellow T-Shirt was a hair. I raised the edge of the T-shirt up and there was a single dark brown strand of hair, just the exact length that Luke's hair was when he was a little fellow. I held the strand in my hand, and realized that I was holding a physical piece of my son once again. A secret that only Lamby-Pie knew and wanted to share with me. I closed my eyes and called out Luke's name, just as Luke had called out Lamb-Pie's name all those years ago, but Luke was silent. Just at that moment, Lamby-Pie reached into my heart and gave me the spiritual presence of Luke. I felt Luke's presence very strongly, and I held that feeling close to my chest as my tears ran across my smiling lips. 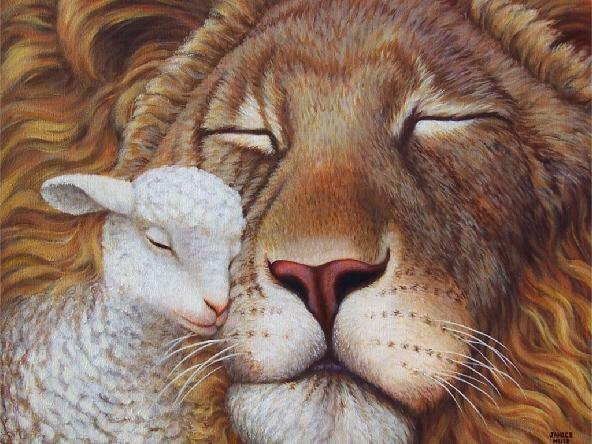 I then knew what Lamby-Pie wanted to tell me in my dream. "No matter how far away someone you love is, no matter how much time has passed, there will always be a part of that person with you. Just call out their name." I thanked Lamby-Pie for this gift as I gently placed the strand of hair back where Lamby-Pie had been keeping it safe for over 30 years. It was where it belonged and where it will remain. Lamby-Pie doesn't need words to speak, and I don't need ears to hear him. Lamby-Pie is silent to my listening ears, but he is my friend, just as he was all those years ago to my little boy who needed a friend so badly. I guess Lamby-Pie comes to those who need him. And amazingly because of a sweet dream and a distant memory that was tucked away in the corners of my mind, peace has found its way to the innermost depths of my broken heart. April and springtime have arrived. Winter is gone and summer is not here yet. We are in the time of spring. A time when the earth comes alive again, no longer buried beneath the cold days of winter. The memories of winter still warm our hearts and the anticipation of summer brings with it more memories of days gone by. 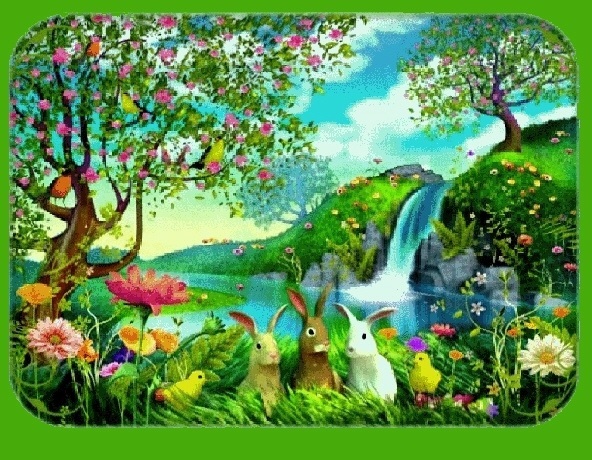 The warm sun of Springtime reminds us how wonderful life used to be, and the spring breeze carries with it a freshness of new life, but we are sorrowful with the absence of a special life. A life that knows no more time. Time? What is it really? Time no longer allows us to be with the physical presence of those special souls that have gone on before us. Those that used to run and play and be happy. Those that were consumed by illness or accident or something else that allowed death to take them away from our arms. We miss having them close and we miss knowing that they are waiting for us when we get home. If only we could speak their name and have them to come to us or look at us in that special way that only they can. But because of the passing of time and the events that time brought with it, it seems that we have lost those things we once had. Are they really lost? Time is the only thing that separates me from my son, Luke, who died on April 3rd, 2001. Time is such a strange thing. When you are in the midst of something awful it seems as if time passes so slowly, and if you are in the midst of something wonderful it seems as if time passes quickly. But as years pass, this thing called time is still confusing. Sometimes it seems as if Luke was here with me only yesterday, but at the same time it seems as if it has been forever since I touched him and held him. Time has brought many things for me since April 3rd, 2001. I went through all the stages of grief over and over and over and over. Anger stared me in the face and for a time I let it stay. Denial was there full force too, but the years have given me the reality of it all. Bargaining lasted only a few months for me as I begged to trade my life for his. Depression is something that still comes and goes and will be with me until the day that I join Luke in Heaven. Acceptance has been the most difficult stage of grief for me, but it has finally found a place within my heart and mind. There was a time when I thought that I could never be at peace with Luke's death. But it happened! Much to my surprise, slowly over time, without myself even realizing the transition..... I felt different. I don't know when it happened, where it happened, or how it happened, but it did indeed happen. I wasn't crying every single day anymore. Somewhere along my journey I quit asking why? I had found some peace, some unexpected peace, in just knowing that he lived a good life, and then he died, but more importantly.... his spirit didn't die. A dog can sense when his master has turned the corner and headed for home. I often think of when Luke was here on earth, at the house, but in another room. I couldn't see him, I couldn't hear him.... but I knew he was in that other room because I possessed that sixth sense that we all take for granted. His spirit was all around me even though he was in the other room unheard and unseen. It is no different now than it was then. He is all around me unheard and unseen. His spirit has survived! Death could not take his spirit away from me, nor could time. This pain will never go away, but it is not as sharp as it used to be. Instead of fighting away the pain like I used to do, I have learned to live with the pain. It is just as much a part of me now as breathing is.... a breathing that has finally calmed to a slower pace. I have embraced this pain and I own this pain and it will always be with me, so I just decided to let it be what it is. I have realized nothing can be changed, no matter how many times I go over thoughts of 'what if.' I have finally put to rest all the horrible thoughts that have haunted me throughout the years of grief. So many of my friends and family didn't understand my pain and because they didn't, I think they were afraid of my pain. It used to make me sad and angry because they didn't reach out. How could they not understand? The passing of time has made me realize that they had never experienced what I had experienced. So how could they possible understand? I am so glad that they do not understand this pain. O how I wish that I did not understand it. I never thought I would smile again, but I did. And I really never thought that I would laugh again, but I did. And you know what I discovered when I finally did? I discovered that he was in my laugh and he was in my smile and he was still in my life. I didn't believe that any of these new feelings could possibly happen, but they did, and I am so glad that they crept in without me knowing. I am now at peace with his death, and because of this I remember not only the time that he died, but the time that he lived. And oh how he lived, and oh how wonderful the memories of his life are. Those memories give me back the time that I thought was lost forever. Death may separate me from his physical self, but time gives me his spirit and his love. I will relish this time that I have with his spirit until I reach that place where he is, where we will meet again, without the constraints of time. I will remember the good times, cherish my peaceful times, and look forward to another time and place. Time was, time is, and time will be again. Springtime is a time for flowers, a time for birds, a time for rain, a time for love, a time to be born, and a time to die. 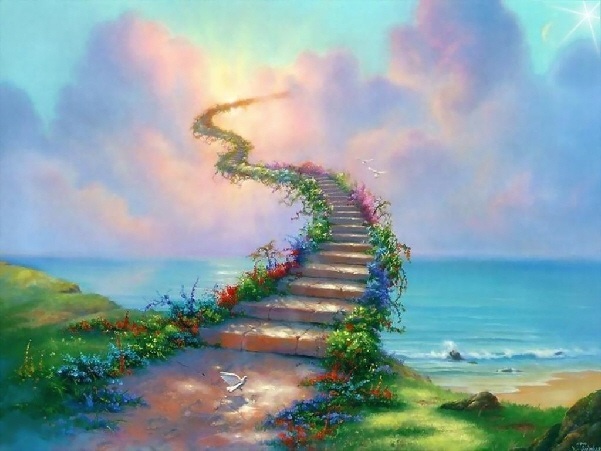 There is a beginning of life and an end of life, but at the end there is another beginning. Time is waiting for us all..... somewhere. Or was yesterday just a few weeks? Maybe yesterday never existed at all. But yesterday is the day that we seek. Or is today when we said goodbye? Maybe today has never really arrived. But today is the day that we cry. Or is tomorrow years from this pain? Maybe tomorrow will never come. But tomorrow is when we'll meet again. That didn't know the way I felt. But I know I'm glad it did. "Is there any way that I can tell you how my life has changed? Any way at all to let you know what sweetness you have given me? There is so much to say. I cannot find the words. Except for these: I love you". Luke was born on Halloween in 1979. It was the best year of my life because our little family of four was now complete. Emily (Luke's sister) and Luke both had piggy banks from the time they were born. When their dad (Robin) would get home from work he would always divide the change in his pocket and give some to Emily and some to Luke for their little piggy banks. They would run put their money in their banks and shake them and smile. They both said they were saving their money for a toy they wanted. At Easter we would have Easter Egg hunts in the backyard. Robin and I would fill the little plastic eggs with pennies, dimes, nickels, quarters, and candy. Robin and I would take turns hiding eggs while one of us stayed in the house with Emily and Luke to keep them from peeking. It was so much fun to sit back and watch as they ran around the backyard hunting for eggs. When they would find an egg, the first thing they would do is pick it up and shake it to see if it had change in it for their piggy banks. When it rattled loudly they would grin from ear to ear. After the hunt was over, they would sit on the floor in the living room opening up each egg to find their treasure. 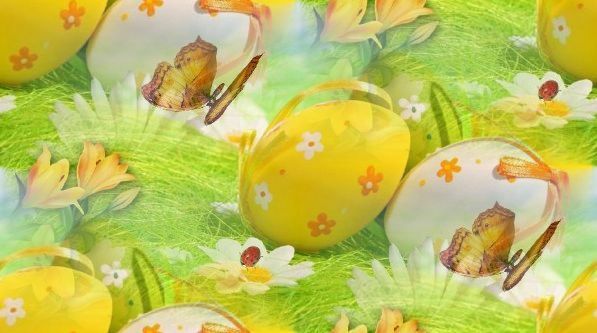 After all the eggs were opened, they would head down the hall to their rooms with a chocolate candy in their mouths and a handful of change to place in their piggy banks. When Emily and Luke were grown, we STILL had Easter Egg hunts, but not only pennies, or nickles, or dimes, or quarters. To keep them interested we also placed dollar bills in the little plastic eggs. It was so much fun to watch them running around the house looking for eggs that contained one dollar bills, five dollar bills, ten dollar bills, and twenty dollar bills. They would still pick them up and shake them, but this time if the eggs made a noise they would look disappointed. They laughed and ran just like they did as children. Throughout the years, no matter if it were twenties or pennies in those eggs, they all contained 'golden' memories. When Luke was about three years old he went in his room, closed the door, and took the plug out of the bottom of his piggy bank and shook it and shook it until he had enough change. He was in his room for hours on the floor making something. When I would knock on the door to check on him he would say....."Don't come in Mommy". When he finished in his room he came running down the hall with the 'something' behind his back wearing a huge beautiful grin. He proudly handed it to me saying..."I 'make' this for you Mommy". There on a piece of notebook paper were quarters and nickels and dimes and pennies glued in the shape of a smiley face. Oh it was one of the most precious gifts I had ever received. My sweet little boy had been saving his change for a long time for a little toy he wanted, but instead he used his change to make a very special gift for me, a gift that I still have tucked away in the cedar chest. I held both the gift and my little boy close to me while I said..... "THANK YOU LUKE." 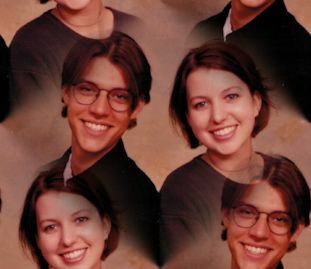 Then, eighteen years later, in mid March of 2001 Luke and I were watching a TV talk show about how people find pennies from their loved ones in Heaven. So many people such had wonderful stories that Luke and I became believers. I told Luke that when I die I will send pennies to him and he promised to do the same for me. Of course I never thought he would get to Heaven first. Robin and I were out of town when Luke died alone in his room. He died in the early morning hours of April 3, 2001 at the age of 21 from Acute Bronchopneumonia. At that time we had no idea how he died and it was six long weeks before we received the results of the Autopsy stating his cause of death. It was late that night, that awful night of April 3, 2001. The coroner had just left our home and Robin and I were finally allowed access to our home again. Luke's sister and friends and some others that I didn't know had finally each, one by one slipped away into the night to go back home with the knowledge that Luke was dead. It was only Robin and I there to face this unexplained tragedy all alone. Robin and I walked into Luke's room together and just stared at that spot on the floor where our only son had died just hours ago. It was all so unbelievable and our pain and sorrow was almost unbearable. We walked around to the other side of Luke's bed so that we could sit there facing his clothing in his closet that we knew would never be worn again by our precious boy. As we sat there crying in each other's arms, I looked down and there on the floor, next to Luke's bed was one ... lone ... penny.... I gasped when I saw it. Robin looked at me and saw me staring at the floor ... He saw it too! He said... "OH MY GOD, it is a penny". I reached down and picked it up while wiping the tears from my eyes to get a good look at the date. I focused my eyes and clearly saw the date. I screamed "OH MY GOD, OH MY GOD". Robin said... "What, let me see." Robin held the penny and he too screamed "OH MY GOD, OH MY GOD". The date on the penny was 1979...... the year that Luke was born. I held my husband and that penny close and once again as I had done years ago, I said...."THANK YOU LUKE". From that night on we found many, many more pennies from Heaven, but none that changed our lives as much as that one little penny did. That one little penny that was delivered to us on the worst night of our lives. That one little penny that made us richer than we ever thought was possible. That one little penny that showed us the way to signs from the other side. That one little penny that gave us the welcomed knowledge that Luke did not end with his death, but that his life just began in another way. We realized that we had to learn a whole new way of communicating with our son. We had to listen differently and we had to see differently......we had to develop new eyes and new ears. We had hope again! Not the hope that our son would be returned to us in the physical way, but the hope that our son would let us know he was with us spiritually in the signs that he sends to us. Luke has sent us so many signs through all of these fourteen long and lonely years. He has shown his presence with pennies, with numbers, in dreams, and in so very many other ways. But no matter what way he chooses to let us know he is with us, any sign that we receive from him will always be known to us as 'Pennies from Heaven'. And, no matter where I am, or who is near, I will always say............"THANK YOU LUKE." No Easter basket filled with grass. No laughter on this Easter morn. It was just a few weeks before Easter and we had already started planning for our Easter celebration with Emily (Luke's sister) & Luke at our cabin in northern Arizona. At that time we lived in the desert and going to the cool mountains was such a treat. Our cabin had just been completed in the fall, so this would be our first Easter at the cabin. We always had an Easter Egg hunt for Emily and Luke even when they were adults (Luke was 21 and Emily was 23), but of course the eggs contained money as an incentive. We also planned a big meal and some hikes and maybe a game of croquet. Robin (Luke's Dad) and I left the house early on a Monday morning to take a little trip to the cabin, just 2 hours away. Luke was still sleeping when we left, so I went in his room and gave him a kiss on the cheek and told him goodbye. But he never knew this, because he was sleeping and I never knew that this would be our last goodbye and my final kiss before he left for Heaven. Luke had told me the day before that he had the sniffles, but none of us thought anything of it. He got up that morning after we left and went off to work and worked a full day. Luke was working a new job as a real estate leasing agent. He was really excited at work because his new business cards had come in that day and because he had just closed a big real estate deal. He called his sister everyday at 12:30 to say hey and see how she was doing. She always waited for his call. He called that day too. After work he went home to shower and change because that night he was meeting his friends at the sports bar to watch a pro basketball game on TV. He even had a $10 bet on the game. He called his friend at 7 p.m. to tell him he would be there soon. It was just a very normal day. Luke never showed up at the sports bar and his friend tried to call him but didn't get an answer. We had also been trying to reach him to see how his day at work went. He never answered the phone at home or his cell phone. We didn't think much of it because Luke was always forgetting to charge his cell phone and the house had a cordless phone so we just assumed that Luke had also let that battery run down on it too. We never talked to him that night and this was unusual, because we always talked everyday. We went to bed that night at the cabin and I had a dream that Luke was dying on the floor of our home. He was saying "Help me Mom, help me." I woke up, sat straight up in the bed, looked at the clock, it was 3:30 a.m. I thought, what a terrible nightmare. I dared not call Luke at 3:30 a.m., he would have thought I had lost my mind. So the next morning we tried to reach him but we got no answer, and assumed he was just sleeping, because he was a very heavy sleeper. Later, still no answer, and then I KNEW, WITHOUT A DOUBT, THAT LUKE WAS DEAD. I told my husband, "I think Luke is dead". He looked at me and said "what's the matter with you, why would you say such a thing". I said "I don't know, I just know that Luke is dead." I still don't know why or how I knew, but I KNEW!!! We started our drive home. In the meantime we asked Emily to go home to check on Luke. When she arrived at the house she called and told us that Luke's car was there, so we all knew something terrible was wrong. She would not go in because she feared the outcome and because I told her that she shouldn't go in. She called a friend to go in. Luke was found on the floor of his room, having been dead for about 18 hours (the exact time of my dream). There was no evidence of why he died. He was just dead, leaning up against the side of his bed, like he was sleeping. There was no sign of a struggle and he looked as though he died without pain. There were no drugs, no weapons, no apparent injuries, no blood, or anything to tell us why he had died. After the coroner left with Luke we turned the house upside down trying to find a reason why he died. We went through the garbage, through his clothing, through the cabinets, through the refrigerator, and through every possible thing in that house. We FOUND NOTHING, but shattered dreams. It was six horrible weeks before we received the autopsy report from the coroners office that stated "Lucas Christopher Ross died of natural cause on April 3, 2001 from Acute Bronchopneumonia". Easter arrived, but not before..... the night the angels came. Flood through my consciousness so fast. He is in his room all alone. Trying so hard to get back home. Through the warm and stale April night. Straight ahead at the red taillights. Police tape across the front door. We're not allowed is what we are told. Although the desert seems so cold. Across the still dark desert air. As I go to my God in prayer. As I shed my own private tears. All of those fond wonderful years. My footsteps stop cold at his door. I want to hold him just once more. Holding on to each other�s clutch. Because we're not allowed to touch. Outside his only sister cries: "No Luke!" As it echoes throughout the night. Until it is out of my sight. For answers of what took his life. Stabbing through our hearts like a knife. That time will not ever erase. Twenty-one years old and he's dead. So misplaced in my mixed up head. I touch his soft beautiful skin. Because of the absence of him. We give him an eternal kiss. This is my last and only wish. Once again he's warm in my lap. Oh when I will wake from this nap. They all come from so far away. On this his everlasting day. Within a never yearned for place. As tears stream down each saddened face. As they each enter one by one. The emptiness has just begun. All alone in his room to die. In some strange unusual way. Each day after day after day. Still make us cry and make us laugh.